Background: Epilepsy is one of the most prevalent chronic neurologic diseases in population. One of the most common disorders in patients with seizure disorders is a psychiatric disease, such as depression, which is most commonly under diagnosed or treated. Objectives: The presence of the psychiatric disease and consumption of antiseizure medications are believed to be an underlying cause of suicides. The present study aimed to determine the prevalence of suicide attempts in patients with epilepsy referred to Iranian seizure organization and neurology clinic of Shohadaye Tajrish Hospital in Tehran, Iran. Patients and Methods: In this cross-sectional study, a total of 200 patients with epilepsy were enrolled in this study and were interviewed. They were asked to fill the prepared questionnaire, which contained clinical variables and 4 specific questions regarding suicidal behaviors related to the Suicide Behaviors Questionnaire-Revised (SBQ-R). Results: The mean age of the participants was 34 ± 10.6 years. Ninety-one patients (45.5%) were male and 109 (54.5%) were female. Regarding the presence of psychiatric disorders; 25% had a history of depression, 3% bipolar disorders, 1% schizophrenia, 4% personality disorders and 65.5% had no psychiatric disorders. Conclusions: The results of the present study show a high prevalence of suicide attempt among patients with epilepsy and these patients should be considered as a high-risk population regarding the suicide attempt and should be thoroughly evaluated regarding psychiatric disorders and suicidal ideation. Seizure is one of the most prevalent chronic neurologic diseases in population. One of the most common disorders in these patients is a psychiatric disease, such as depression, which is most commonly under diagnosed or treated. Seizure is one of the most common chronic neurologic diseases worldwide; 1% of people in America and about 45 million people around the world have this disease. The incidence rate of seizure is about 5% to 10%. Three percent of all the people in the world had at least one seizure attack in their life that the high incidence of this had been at onset of childhood and the end of adolescence. According to 8 studies that were reported about epilepsy, 5% of patients with seizures died due to suicide whereas this prevalence was 1.4% in general population (1). Murphy at 1994 reported that there was no clear relationship between seizure patients that did successful suicide and unsuccessful suicide (2). In general population, a suicidal attempt rate in women was 2 times higher than in men whereas the successful suicide rate in men was 3 times higher than in women. The prevalence of suicide is similar in patients under the age of 40 and higher. However, the suicidal attempt occurs usually under the age of 40 and the prevalence of suicide attempts is 10 times more than that of the successful suicide. After an unsuccessful suicide, the risk of next successful suicide is approximately 10%. The suicidal attempt is usually done by drug overdose and self-poisoning .In patients with seizure, it occurred 7 times more than in the general population (3). Also, 65% of the drugs used for suicide were antiepileptic drugs and 60% of these were barbiturates (4). To prove this argument, two studies were done showing 10% of the people referred to poisoning department in emergency manner were epileptic patients who were under the treatment with phenobarbital. In another study, the rate of suicidal ideation and attempts in cases under treatment with phenobarbital was 47% versus 4% in the general population. Overall, one of the underlying factors for suicidal behaviors was a psychiatric disorder (2). Mendez et al. at 1989 (5) assessed the induced agents for suicidal attempts that interracial psychopathologic factors were the most important factors. In other studies, suicidal attempts in patients with epilepsy were compared with suicidal attempts in other powerlessness disorders which showed the prevalence rates of suicidal attempts in patients with epileptic seizure and powerlessness were 30% and 7%, respectively. Therefore, an adverse psychosocial status was not the only reason for this high prevalence (5). 1) psychological disorders and psychotic episode, dysphoric episode, twilight states, personality disorders. 2) Adolescents with the age range of 25-49 years old. 3) generalized seizure, temporal lobe epilepsy especially with cerebral lesion. 4) Long duration of disease and inappropriate treatment. 5) copious antiepileptic drugs accessibility (6). This study aimed to determine the prevalence of suicide attempts in epileptic patients referred to Iranian seizure organization and neurology clinic of Shohadaye Tajrish Hospital using the Suicide Behaviors Questionnaire-Revised (SBQ-R). In this cross-sectional study, 200 patients with epilepsy referred to Iranian seizure organization and neurology clinic in Shohadaye Tajrish Hospital in Tehran, Iran (referral centers) were selected, enrolled and interviewed. They were asked to fill the SBQ-R questionnaire that included demographic characteristics, history of psychiatric disorders, history of opium addiction or alcohol addiction, drug history and 4 questions that the first question was about suicidal ideation and attempt with a rating of 1 to 4 points, second question was about the period between suicidal ideation and attempts with 1 to 4 points, third question was about suicidal ideation sharing that this question had 1 to 3 points and the last and fourth question was about future suicide probability that this question had 0 to 6 points. Finally, when the average of these points were equal or more than 7 points, these patients were classified into high-risk group and when these points were less than 7, they were classified into low-risk group for suicide attempts. The data were analyzed using SPSS (version 16).We used some indexes such as relative frequency, mean, confidence interval, confidence error in data analysis. Personal information was saved as confidential and only the final results were reported. Researchers were loyal to Helsinki ethical guidelines in all steps of this study. The patients were allowed to withdraw from the study and in this case, other patients were enrolled and included in the study. The present study was performed to assess the prevalence of suicide attempts among the patients with epilepsy referred to Iranian seizure organization and neurology clinic in Shohadaye Tajrish Hospital in Tehran, Iran, using a SBQ-R questionnaire. 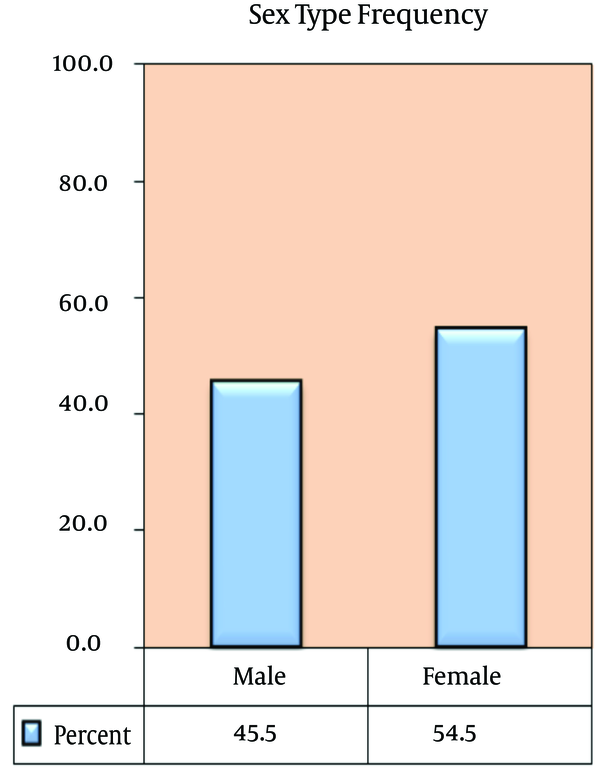 From a total of 200 epileptic patients with the mean age of 34 years old, 91 cases were male (45.5%) and 109 were female (54.5%) (Figure 1). The youngest case was 17 years old and the maximum age was 59. 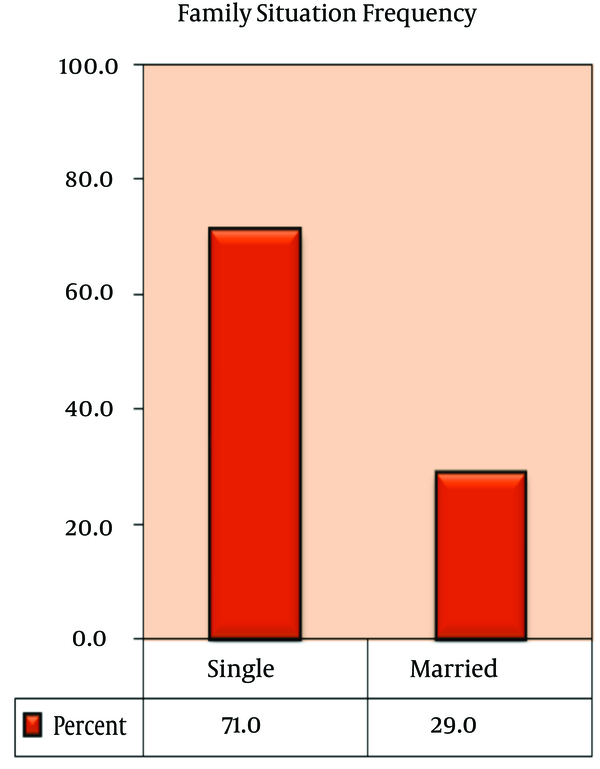 Moreover, 142 cases were single (71%) and 58 were married (29%) (Figure 2). One hundred and thirteen patients were unemployed (56.5%), 43 patients were employed (21.5%); 36 patients were collegians (18%) and 8 patients were students (4%). Regarding the history of psychiatric disorders, 51 patients (25.5%) had depression history, 6 patients (3%) had bipolar disorder, 2 patients (1%) had schizophrenia, 8 patients (4%) had personality disorder and 131 out of all patients had no history of psychiatric disorders. 11 patients (5.5%) were addict, 3 patients (1.5%) had history of alcohol or opium addiction and 186 cases (93%) out of the total patients had no history of addiction. Drugs that were used in this study were carbamazepine (71%), phenobarbital (66.5%), phenytoin (63%) and sodium valproate (58.5%), respectively. Seizure is one the most common neurologic disorders with 3% prevalence in general population. Seizure is the recurrent attack which means excess, sudden and jerky uncontrolled discharge of electricity in the brain neurons. Seizures are episodes of disturbed brain activity that cause changes in impression, behavior, perception and level of consciousness. Some studies showed that the occurrence of psychiatric disorders in patients with epilepsy were more than that in general population (1). In our study, the total average in all patients was 5.5 and 39 cases had 7 points or more. 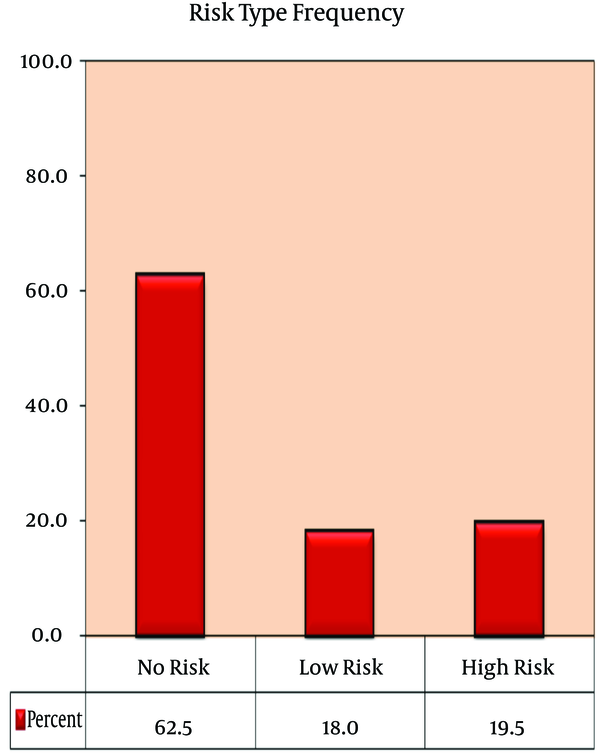 It showed that 20% of the epileptic population in our study was in high-risk group (Figure 3). More than a quarter of patients with epilepsy have psychiatric disorders that may need treatment, and more than 10% of the patients in psychology hospitals have epilepsy. In our study, a quarter of all patients had a history of depression. Chang and Lowenstein assessed neurobiological, psychological and social variables and showed that 6 out of 7 prognostic factors in patients with epilepsy were psychosocial factors (7). In another study which was done by Christensen, 21169 people were in the case group and 423128 people were in the control group; 492 people (2.32%) among suicidal patients had epilepsy whereas in the control group 3140 (5.66%) of these had epilepsy (RR = 3.17). Other factors that are important in suicide attempts were assessed and the most important factor to induce suicide in patients with epilepsy was psychiatric disorder (8). Mainio et al. at 2003, (9) demonstrated that 1.3% of the cases with suicide attempts were epileptic patients in hospital and in these patients epilepsy was diagnosed 8.5 years in average before suicide.Krapelin demonstrated the depression episode in dysphoric mood such as depression mood, irritability, anxiety, headache, insomnia and euphoria mood. These symptoms have no relation with epilepsy symptoms. The first suicidal risk in patient with epilepsy is primarily related to an intense depression episode in the interictal phase (10). Kalinin assessed the effect of gender on suicide at 2005 and demonstrated that the risk of suicide was high in the simple partial seizure, primary generalized seizure and complex partial seizure and the low risk of suicide was in secondary generalized seizure. The secondary generalized seizure can be an important risk factor for mental deterioration which can trigger a suicide and a complex partial seizure is an important risk factor to suicide among females (11). Depression in senile people suffering from a chronic disorder has a stronger relation with suicide than in adolescent (12). However, suicide is common in female adolescents. Axis 1 disorders were recognized as primary risk factors for suicide, other impressive factors that induced suicide were family disorders, physical disorders, personality disorders, stress, previous suicide attempts, and drug availability. The occurrence of suicide in family increases the risk of suicide among the epileptic patients (13). The results of this study show the high prevalence of suicidal ideation in patients with epilepsy that this prevalence rate is more than that in general population. This high prevalence demonstrates that the scholastic assessment of psychiatric disorders plays an important role in suicidal ideation. We acknowledge all support provided by the hospitals, neurology centers and individuals who assisted us to conduct this study. We also would like to thank the participants who completed questionnaires. Authors’ Contributions: Sayena Jabbehdari was responsible for the study conception and design; Hosein Delavar Kasmaei performed the data collection; Omid Hesami and Arash Bostani analyzed the data; Sayena Jabbehdari was in charge of the drafting of the manuscript; Hosein Delavar Kasmaei supervised the study.